Find the best Testing and QA services at SoluLab Inc.
We provide the finest software testing and QA services in USA and Canada. 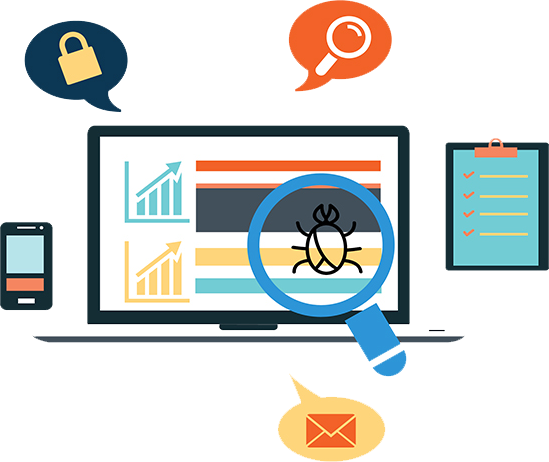 Hire our talented testers to get the bug free software solutions. Connect with Now! SoluLab is a leading offshore Software testing provider for IT Products. At SoluLab we render a broad range of services in the QA Software Testing industry by combining proven methodologies with the experience & knowledge that our consummate professionals have gathered in last many years. In simple words, SoluLab is the solution of your offshore testing services, Software Quality assurance, Automated Testing, Core Functional, Independent Validation & Verification, Installation and Usability testing. As an offshore Testing company based in India, we are flexible with our cost and timeline. SoluLab’s Offshore software QA services for our clients is innovative, stretchable and scalable model that will ensure High RoI on QA investments with an intent to provide 100% test coverage, faster test cycle at the reduced cost. It leverages concepts such as Just In Time resourcing, also a single point of contact that manages resources and stays on top of the issues that will help clients utilize SoluLab’s expertise in delivering high quality and stable software applications. At SoluLab we understand the significance of mobile application testing, as we are well aware of the fact that today mobile application has become a part of day to day life of many individuals, companies, organization. From last many years SoluLab has been thriving when it comes to deliver Mobile application testing solutions. SoluLab follows tested and proven methodologies to deliver our clients quality work without any compromises from both ends. We trail interactive frameworks such as operating systems & internal hardware so the user gets affluent experience for their mobile games, mobile application etc. Stay on top and get rich experience by opting mobile apps testing and solutions offered by SoluLab at a very recession-friendly rate with full compatibility & usability. Go for handsets testing to reduce testing budgets and develop overall product quality. Opt for SoluLab’s handset testing and get a rich and error free experience. SoluLab follows organized Manual Function Testing Practice to deliver projects with accurate results. At SoluLab all the test are been followed in a very sequential manner. SoluLab has acquired expertise on development & design mobile application testing tools. SoluLab’s testing services will heed of all possible app aspects also included is end-use expediency. SoluLab has also set up a dedicated multiplatform mobile application testing lab. SoluLab can surely help you refine your software and mobile applications. With our talented software testers, you expect a fine and bug-free application. Connect with SoluLab for software testing and mobile application testing inquires!